Please contact me for tips and assistance with using this EA. I am always working up new setting files. Please see the market web page for this product and go to the comments area. I am uploading set files for various strategies and answering all of your questions to help you get consistent results with this EA. Thank you. This EA opens trades by price action, number of pips per number of seconds, or Bollinger Bands, or candles High/Low. It opens one trade at a time unless pending orders are not set to OCO. In that case it will open more than one buy or more than one sell. It does not use martingale or any other risky strategies. We use daily, weekly and monthly targets to prevent too much trading that only leads to losses. We use an RSI Filter to avoid trading during slow periods (Must set to true). Download set files for various strategies in the comments area. Always trade an Ea on a demo account before using it on a real account. Place orders if under the max spread (in points). Maximum price slippage for buy or sell orders. Attempt to resend order if error. Attempt to close order if error. If trading account gets down to X$ it stops trading. Trade each day until you are in profit and stop trading until the next day. Target X pips profit (set to 5000 to disable). Target X pips loss (set to 5000 to disable). This feature will open a buy order X number of pips above a trade signal and a sell order X pips below the trade signal unless invert pending is checked, then it will reverse it to pending sell above and pending buy below the trade signal. Open 2 buy orders or 2 sell orders. Open 1 buy order and 1 sell order. Invert open 1 buy and 1 sell. Delete pending orders after X seconds. X pips above (Buy Order). X pips below (Sell Order). 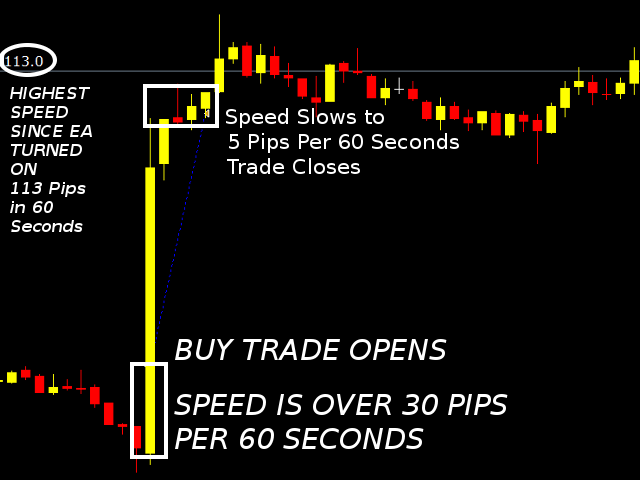 On/Off open trades by X pips in X seconds. Open trades when X candles close higher/lower On/Off. Open trades when X candles close higher/lower (number of candles). Open buy on cross upper BB band. Open sell on cross lower BB band. Open when X candles close after bands. Take profit (pips value) (if 0 disable). Stop loss (pips value) (if 0 disable). Trailing start (if 0 disable). After x pips in profit move SL to break even (if 0 disable). Lock in X pips for break even. Close trade in opposite direction On/Off. On/Off close when speed slows down to this level. Close all pending orders On/Off. Filter trades by RSI On/Off. Allow only buys above line. Allow only sells below line. I purshased this EA one month ago. there is a lot of set up possible. actually i am using the set file provide bye scott "4 pips per 1 sec" and it works really great. to get it the most profitable, it is better to close trade manually, you will win huge profit. 100% auto it is good too but the amount of profit is reduced. so many possibility with this EA. have to study it well, and we can have great return. Scott is aslo really reactive, disponible, and helps a lot. - Fixed a Pending Orders Issue when Grids were on. - FIXED: DAY/TIME Filter was not working properly in last 2 previous updates. This is now fixed. Grids will continue to trade even if you set the day to false. Only Initial trades will not open on days set to false. - NEW Candle Trailing - Start Trailing when in X Pips Profit. 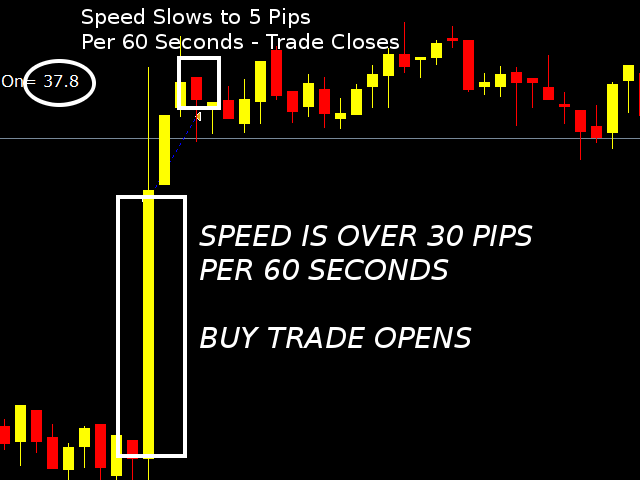 - Added the ability for decimals in "X Seconds" Inputs for the "X Speed per X Seconds" open trades feature. 4) Break-Even will now have a way to lock in X pips profit when we get those crazy Fake Breaks.